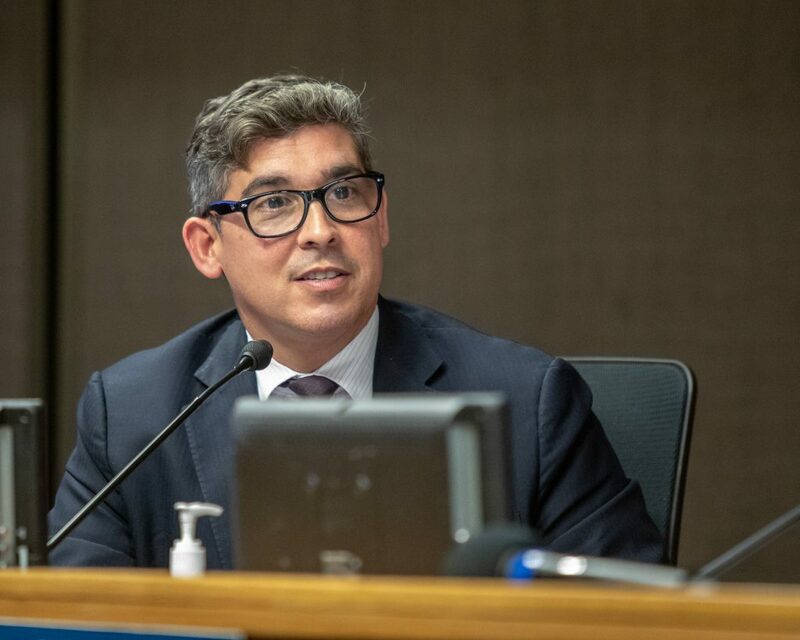 While all five board members on the DJUSD School Board were supportive of seeking local funding for teacher compensation increases, the board was not ready to put the matter on the ballot for November 2020 just yet, and instead wants to strategize on how to pitch the issue to the public. He pointed out that in the past, since 1984, “Every parcel tax was a reactionary initiative to prevent a cut from the state” and that here they are trying to go strategic and be proactive rather than reactive. “Why has there been this perhaps decades long historical situation that we’ve placed ourselves in as a community,” Mr. Fernandes continued. “We can no longer sort of rest on that, given the fact that we’re looking at teacher shortages. Tom Adams pointed out that we are now back to the level of funding in real dollars that we had just before the recession. But there is a key difference. In 2008, as confirmed by Bruce Colby, the District’s Associate Superintendent of Business Services, the percentage of general fund money going into CalSTRS was just 8 percent. Now it is at 18 percent. That is money that is coming directly out of general fund money. For Joe DiNunzio he said that he was fully in favor of moving forward with a significant effort to make this a priority, but he wanted the process over the next few months to look closely at current spending and their options. Cindy Pickett noted that there had been previous debates over whether the district should put its money into programming or teachers. She pointed out that we talk about them as though they’re separate things. Alan Fernandes pointed out that he will not be willing to support another program which ties us to long term cost until the district passes something to address its revenue problems. He added that more state funding is not going to close the compensation gap – we must do that locally. He sees two ways to do address it – one is with a new source of local revenue and the other is by fundamentally changing the nature of the education we provide. The board decided not to pass something on Thursday and instead will take it back to a subcommittee of Alan Fernandes and Joe DiNunzio, who will meet publicly to discuss the needs and find a way forward. Fernandez really deserves a lot of credit for consistently leading on this issue. Hopefully with the addition of DiNunzio and the formation of a subcommittee together they will be able to craft something that addresses the chronic non-competitive compensation of teachers in DJUSD. A united and mobilized Council would have certainly helped sell the need for a supplemental funding measure prior to a public vote. Several talking points could have been raised in support. The Finance Department could have prepared cost/revenue projections if directed to do so. The economy was improving, tax increases had been held in abeyance during the darker economic times, and the city revenue stream showed promise for the future. We can’t, however, cite just the Council for leadership failure. Other leadership components should have mobilized themselves and others to march in-step with our governing body. Where were the city employee unions, the community advocates demanding increased city services for particular needs, the department heads? All would directly benefit and yet their voice and presence during the campaign were notably lacking. Add to the three “no’s” in the above quote, there was no city leadership and initiative. They received in return exactly what they invested, nothing. — No governmental leadership and initiative. The School District can avoid those four “No’s” by conducting a considerable number of well-planned, well-publicized and well-attended community meetings held in various locations around the City. That kind of pre-election education process was conducted by the City in 2013 when Measure I was on the ballot. Those education sessions were preceded by the thorough multi-month Water Advisory Committee process, all of which was funded by the City, organized by City employees and senior managers, and attended by multiple Water Advisory Committee members, as well as City employees and City senior managers. The School District needs to be similarly proactive regarding the issues and concerns that make this Parcel Tax funding necessary.